The U.S. Office of Strategic Services recruited Germans to infiltrate the Third Reich. By the autumn of 1944, most of Nazi-occupied Europe had been liberated by Allied forces. The conquering armies now faced the invasion of the German homeland. But, in this phase of the war, they lacked intelligence networks behind enemy lines. The well-developed resistance organizations in occupied France, Holland, Belgium, Yugoslavia. and even Fascist Italy had been ready to receive OSS (Office of Strategic Services, forerunner of the Central Intelligence Agency) and SOE (British Special Operations Executive) agents and support espionage and sabotage operations. Inside Hitler’s Germany there was no significant underground framework that would compare to the dedicated guerrillas in countries held captive by the Nazis. The obstacles to the intelligence flow from inside Germany were brutally demonstrated by the powerful surprise offensive in the Ardennes during December 1944. The bloody Battle of the Bulge was a direct consequence of diminished tactical and strategic intelligence coming out of the Reich to American commanders. OSS planners estimated that no American could survive in the ruthless fascist police state. British intelligence supported the assessment that no Allied agent could avoid capture by the Gestapo inside Germany. The only Allied agent that had any chance of operating in the Reich was a nativeborn German. During the night of September 2, 1944, German-born socialist and passionate anti-Nazi Jupp Kappius became the first OSS agent to parachute into Germany. This was the first of many missions inside the Reich. Operations were launched from Britain, Italy, France, and even neutral Sweden and Switzerland. The missions would include both German-born civilians and OSS military officers. Unique among the series of penetration campaigns was that conducted by the U.S. Seventh Army’s OSS Detachment. Lieutenant General Alexander Patch, commander of the Seventh Army, was desperate for actionable tactical intelligence in order to continue the advance into Germany. He requested help from the command’s OSS Detachment Secret Intelligence chief, Henry Hyde. The crusty OSS civilian had exhausted the French espionage contacts who had contributed to the rapid liberation of their homeland. However, these agents were of no value in piercing the German super police state. Hyde proposed the innovative but controversial idea of using German prisoners for spy missions into the Reich. However, this type of operation was contrary to theater command policy and probably the Geneva Convention. General Patch ordered Hyde to proceed with the plan after receiving a very subtle endorsement from OSS commander General William “Wild Bill” Donovan. Hyde chose a number of officers to assess German POW recruits for the special missions behind enemy lines. One of the officers chosen was First Lieutenant Peter Viertel, United States Marine Corps. The 24-year-old Marine officer had been born in Dresden, Germany, but came to the United States with his movie director father and grew up in Hollywood during the glamour years of the 1930s. Viertel was already a talented and established writer who had written the screenplay for the 1942 Alfred Hitchcock spy thriller Saboteur. He transferred from the Marine Corps to the OSS because of his fluency in the German language. Initial selections were made from several demographic POW groups, Catholics, Austrians, and those who had been assigned to punitive battalions because of their political views. Potential recruits were cleverly transitioned from the main prison population through assignment to work details. After days of observation, the candidates were given intense interviews to determine their motivation to “betray their country” by returning to Germany as American spies. German POWs were recruited from the Sarrebourg stockade in Lorraine. The confinement facility was located in a stone barracks that was built at the turn of the century and was surrounded by a high wall that had been topped with barbed wire. Hundreds of German prisoners shuffled around the old drill field in the center of the compound in their long winter issue overcoats and tried to fight off the somber mood of defeated soldiers and the gray chilly fog. The Seventh Army’s OSS Detachment Headquarters was located in a turreted chateau near Lyon, France. The elegant mansion contained an ornate interior with mirrored walls and period furniture. Other sections of the detachment were billeted in hunting lodges, villas, and convents throughout the remote mountains near Stasbourg. Recruits were taken by the OSS team to a small inn hidden among the fir trees in a snowcovered forest near the village of Birkenwald. Basic espionage training was given in the dining room, which was furnished with a large oak table surrounded by heavy wooden chairs. The room contained a blackboard, which was used for teaching English and the identification of weapons, insignia, and unit designations. The OSS instructors were shocked at how little the average German soldier knew about their own army aside from experiences in company-level units. Rudimentary parachute training was given by dropping the recruits and all of their equipment 10 feet from a platform onto a sand pile. The insertions were made in isolated areas away from towns to avoid observation and allow agents time to bury their parachutes. The establishment of a credible cover story was the most important detail in preparing for the clandestine operation. A credible false identity and believable explanation for traveling were the differences between life and death for OSS spies. All German soldiers carried a Soldbuch, a summarized personnel file that contained their religious, political, military, and medical profile. This document was routinely checked by security forces and compared with travel orders and train tickets. Any inconsistencies between documents and oral statements were grounds for immediate arrest. The cover stories had to include good reasons for traveling. The most acceptable justification for a soldier traveling alone was that of returning to his unit after being hospitalized for medical treatment. But this story had to be absolutely supported by a clinical diagnosis contained in the Soldbuch. False documents were produced by both OSS London and the Detachment to support specific missions. These included a personal photo and letters with fabricated signs of age and wear to give authenticity to the agent’s cover story. Initially, agents were sent into enemy territory by ground infiltration, but hardened American infantry tended to be uncooperative. They viewed the OSS operation as a “no brainer” that was simply returning enemy soldiers to their units to fight again. 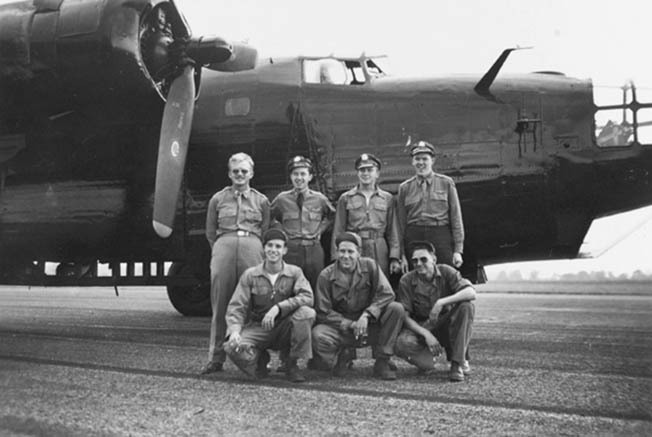 The crew of an American Consolidated B-24 Liberator bomber used for covert OSS operations poses prior to a clandestine operation over Central Europe. Peter Viertel introduced the idea of using parachute insertions. The operations, called “tourist missions,” consisted of short incursions into the Reich. Agents would enter German territory for approximately one week and travel an assigned route and then return with a report on their observations. The agents were provided with authentic documents acquired from POWs in the confinement stockades or well-produced forgeries from OSS London Station. The Seventh Army OSS Detachment’s parachute insertions were successful during the months of January and February 1945. The detachment also began to recruit women for espionage missions. Inside wartime Germany, females were under less scrutiny from the Gestapo and military security forces. Males were routinely stopped for questioning and document examination to control the rising desertion rate. Three women were recruited by Viertel from the Strasbourg stockade. They were code-named Ada, Emily, and Maria. The most successful and the most frustrating for the Marine case officer was Maria. She had been charged with being a Nazi collaborator and had been the mistress of a German officer. Maria volunteered for OSS service hoping to obtain vindication. This appeared to Viertel to be a credible motivation. His recruit claimed to have work experience as a nurse in German hospitals and a food service worker in German Army mess halls. The reward for her OSS service would be a letter stating that she had performed espionage missions inside the Reich for the American military. Her Alsatian background gave her fluency in both French and German. This would be a valuable asset across the Rhine. On February 3, 1945, Maria was transported from the OSS training site in the mountains near Strasbourg to an airfield near Lyon for her flight and parachute drop into enemy territory near Stuttgart. She would travel using the cover story of an Army nurse. As she was preparing to board the plane, she stunned Viertel with the revelation that she was pregnant by her Gestapo lover. The exasperated OSS Marine demanded an explanation. The timing of this report was terrible. A great deal of effort and money had been invested into the mission. Maria reassured Viertel that she was ready and able to execute the mission but wanted OSS help in obtaining an abortion when she returned. Viertel agreed to her request. She returned two weeks later with exceptional intelligence information on the specific location of a German Army headquarters, troop deployments, and staging areas. Her highly successful mission was rewarded with the abortion, but only after persuading a reluctant French doctor that Maria was patriotic and a war casualty of sorts. On May 7, 1945, General Alfred Jodl, chief of the German Army operations staff, signed the surrender documents ending the major fighting in the European Theater. The OSS accompanied the U.S. Army Occupation Forces into Germany to begin rebuilding the devastated country of the former enemy. The first step was the de-Nazification of the Reich. This required a methodical sorting of Nazi war criminals from the general population in order to select leaders for the new Germany. This assessment was easier said than done. To facilitate the process, American military authorities took a surprising change of attitude that was disturbing to Viertel and other OSS agents. Viertel was a German-born Jew who had argued for the use of German nationals for the OSS espionage operations. He had confronted reluctant and sometimes hostile American military commanders with the argument that there were many trustworthy Germans and they should not all be judged as Nazis. However, in the postwar atmosphere he and other OSS personnel felt that U.S. officials made too quick a reversal in their attitude and over-embraced the position that most Germans were innocent of Nazi involvement. Viertel returned to Hollywood and wrote the screenplay for the 1951 spy movie Decision Before Dawn, which was based on the novel Call It Treason, written by his OSS comrade George Howe. The film was a composite of Viertel’s and Howe’s experiences in the Seventh Army OSS Detachment’s German POW espionage operation. The story was filmed in Germany and realistically portrayed a young, idealistic Wehrmacht corporal on an OSS mission inside the Reich. Viertel went on to assist director John Huston with the script for the 1951 film classic The African Queen. He would later marry the popular movie actress Deborah Kerr. Nearly 200 OSS agents were inserted into Nazi Germany from various locations during the last months of the war. They infiltrated the major Reich cities of Bremen, Munich, Mainz, Dusseldorf, Essen, Stuttgart, and even Vienna and Berlin. The Seventh Army OSS Detachment was the most successful in providing direct field support against Germany. It inserted 44 parachute missions behind enemy lines between January and May 1945. The total cost of penetrating the Reich was 36 casualties that included agents killed or missing. The return on the high human cost was precise tactical and strategic intelligence on enemy military and industrial targets that shortened the war in European Theater. Peter Viertel died at age 86 in November 2007. He not only left his mark on the OSS, but in Hollywood as a writer, collaborating with such greats as Ernest Hemingway and John Huston to turn novels into screenplays and successful movies. Tags Alexander M. Patch, Alfred Jodl, Allies, Axis, Battle of the Bulge, Ernest Hemingway, espionage, Geneva Convention, George Howe, henry hyde, jupp kappius, Nazi Germany, Office of Strategic Services (OSS), peter viertel, POW, Special Operations Executive (SOE), United States Marine Corps, William “Wild Bill” Donovan.